As with humans, water is a crucial part of a cat’s diet so it’s important that they have access to a fresh, clean supply at all times. Although cats are able to survive on less water than dogs – their desert-dwelling ancestry means they can adapt well to dry conditions – they are still prone to dehydration and this can lead to common health issues such as constipation, lower urinary tract disease and urinary blockages. Mature moggies (aged 11 or older) in particular will need to drink plenty of water each day as their kidneys will need a bit of extra help to function properly. 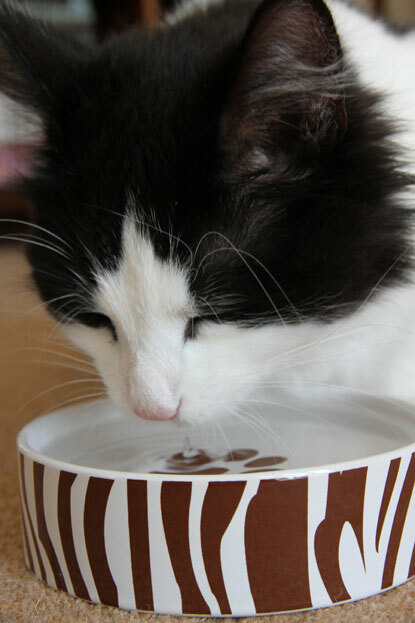 It’s important to remember that milk, cream or any other liquid is no substitute for water in a cat’s diet. In fact, cats are lactose intolerant and have difficulty digesting dairy products, so drinking milk could make them unwell. The thought of drinking from a glass of water that’s been sitting around on the floor for a few days probably doesn’t sound very appetising. Your cat is likely to feel the same, so they will appreciate a fresh, clean bowl each day. Cats prefer drinking in different locations. Give them plenty of options to choose from so that a bowl of water is never too far away. Cats may also have a preference for a certain type of bowl. Plastic and metal bowls can taint the water, so try using a ceramic or glass bowl instead. Cats usually prefer wide, shallow bowls as it allows them to keep an eye on their surroundings while they’re drinking and keeps their whiskers from touching the sides of the bowl. Allow the cat to be able to sit behind the bowl of water so they can see all around them. Many cats are attracted by the movement and freshness of flowing water, which is why you may have witnessed them try to drink directly from the tap! There are many pet water fountains you can buy online or from your nearest pet store. Just as you would not want to drink right next to your toilet, cats aren’t keen on drinking near their litter tray. This is carried over from their African wild cat ancestors, who would toilet away from their water source to avoid contamination. Keep the two in separate rooms if possible. Cats also don’t like to drink near to where they eat. This is also carried over from their African wild cat ancestors, as the gut contents of their prey could contaminate the water source. Place their food and water bowls in separate locations. Canned food contains about 70-80% water so will help your cat get a good proportion of their daily water requirement just from eating. If they’re eating mainly dry cat biscuits, they will need to drink a lot more water. If you do switch your cat’s food, make sure you do it gradually as this will reduce the chance of loose stools. Adding a few drops of tuna juice (from tuna packed in water, not oil) or chicken broth will make the water more enticing for your feline friend. Just make sure the flavouring doesn’t include too much salt, as this is unhealthy for your cat. If you are concerned about any change to your cat's behaviour, including changes to their normal eating and drinking habits, please consult your vet. For more advice on cats and drinking, visit the Cats Protection website.